Gourmet burger doesn’t exactly sound tough and strong, does it? Yet, when Walt Disney World sprinkled these third pound gems throughout property over the past year, they made sure to drop one smack dab in the middle of Frontierland. So, how does a gourmet burger save face in the wilds of the West? Simple, by abandoning its namesake! 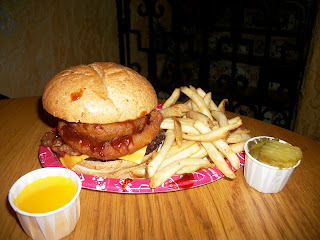 To be clear the gourmet burger found at Pecos Bill Tall Tale Inn and Cafe is no whimpy burger. The third pound Angus cheeseburger is so much more than your typical burger. This cheeseburger is stacked as high as the buttes and packs a punch, as you would expect from any hombre of the frontier. The combination of bacon, cheese, barbeque sauce and thick-cut onion rings make this a third pound powerhouse. When I bit into my sandwich, it definitely stretched the limits of my jaw. There is a great smoky flavor that plays back and forth between the bacon and barbeque sauce, while the onion provided some crunch and an acidic bite. This burger was good, really good, but topping it off with a few pickles and sautéed mushrooms from the fixins bar really made it shine like a lawman’s star! The variety of entree options has been improving throughout the Magic Kingdom over the past several years, and while the Angus cheeseburger found at Pecos Bill isn’t the healthy option we’ve written so often about here at the Main Street Gazette, it is a burger to write home about. If you are looking for something to fill you up for the rest of the day, this is the burger, although you may have to figure out how in the world you’re going to cram that Dole Whip in later. Hey Howdy Hey!! You obviously took a photo of my exact meal... from yesterday! And yet I'm now hungry once again for my Angus Deluxe... even though it's 9:30 in the morning! I like this burger - I was pleasantly surprised the first time I had it and have ordered it a couple times since then. Much better than the hockey pucks, but still not replacement for a REAL burger. I love these, they are amazing! Now I'm craving one...thanks! Lou, great stomachs think alike! Sarah, you're right on all counts! It doesn't stack up to true burgers. However, as WDW burgers go, it's pretty good.